Recognition of the resurgence of State Street as a busy, 7 day a week, 18 hour environment, and the opportunity to be at the heart of and key ingredient of the revitalized retail subdistrict within the historic state street corridor caused Sears to rejoin the street after a 25 year absence. The return of a full-line Department Store offers a symbolic turnaround for this world famous retailing street. 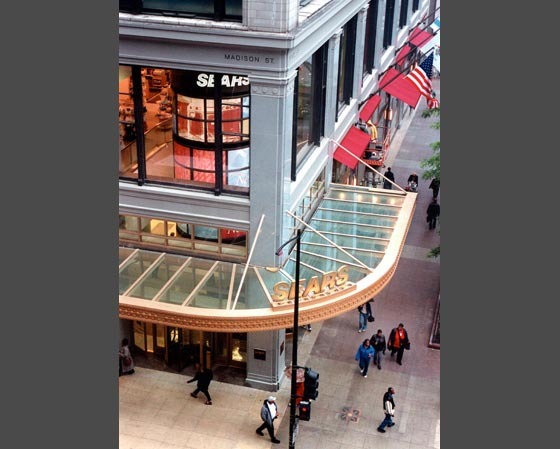 The store is intended to be a prominent flagship for Sears and a key element in its planned return to urban retailing. With 5 floors and 250,000 square feet, the store will be a major presence on the street. It is located within a 20 story mixed use building that dates to the early 1900's. The design strategy is to complement the historic frame of the building with elegant new architectural intrusions that combine with dramatic lighting and graphics that make a major statement for the revitalized building and the company. A key feature are the large ‘show ‘windows that now front on the street and will become part of Chicago's great "Christmas Display Window" tradition on State Street. They also offer glimpses into the store of merchandise and customer activity.. A second key feature is the new curving canopy and interior display drum that mark the primary entrance at the "busiest corner in Chicago".